The Ohio Lottery Commission has put up a new billboard on the path of my walk home from work. 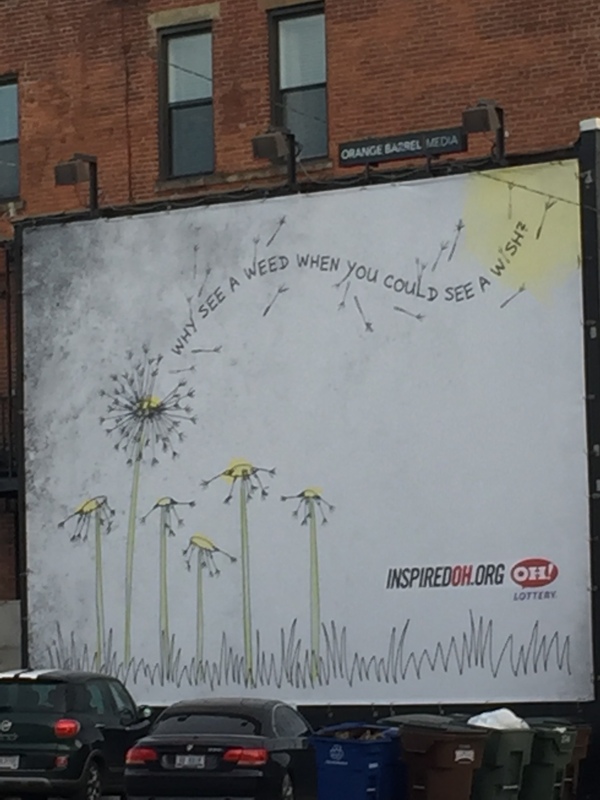 It features a line drawing of dandelions gone to seed and dandelion seeds wafting in the air, with the saying “Why see a weed when you could see a wish?” The billboard refers to inspiredoh.org and has the Ohio Lottery logo. The obvious message of the billboard is that it is all about perception. Why see something as a negative that you could see, instead, as a dreamy positive? But what is supposed to be the weed, exactly? Is it Ohio, and have the “inspired Ohioans” used their positive viewpoints to turn our state into a place where dreams come true? Or is the Ohio Lottery just trading on positive stories about Ohioans who are doing good to try to shift the perception of the Lottery itself? Do they hope that people who now view the Lottery as a merciless way of extracting money from people who will never beat the overwhelming odds and really can’t afford the lottery tickets they buy every week will see it instead as a harmless way for people to dream about how they might have a better future? Either way, the billboard message doesn’t work for me. The fact that, for a brief period every summer, little children might blow the seeds off dandelion puffballs doesn’t make the dandelion any less an invasive, destructive, ugly weed. It’s interesting, and telling, that the Ohio Lottery has chosen to associate itself with a weed.